Zheng, Y.P., Li, R.Q., Guo, L.L., Hao, L.H., Zhou, H.R., Li, F., Peng, Z.P., Cheng, D.J. and Xu, M. 2018. Temperature responses of photosynthesis and respiration of maize (Zea mays) plants to experimental warming. Russian Journal of Plant Physiology 65: 524-531. One of the concerns about global warming within the agricultural sector is that rising temperatures will reduce crop yields. This assumption is primarily based on plant net photosynthesis measurements across a range of temperature values. Plotted graphically, such data generally depict an inverted u-shaped curve, where photosynthesis rises as temperatures warm, then peaks at an optimum temperature value, after which it declines towards zero as temperatures continue to rise. Accordingly, the perception of many is that if temperatures warm in the future, more plants will experience growing conditions on the down-side of the temperature/photosynthesis curve, resulting in less-productive growth and yields. A new study by Zheng et al. sheds some important light on this subject. Working with maize plants (Zea mays), the nine researchers conducted a field experiment to examine the crop's potential for thermal acclimation. In doing so, they grew maize at the Yucheng Comprehensive Experiment Station on the North China Plain, an area of widespread maize production, under normal and elevated temperature conditions. Elevated temperature plots were warmed by infrared radiators, resulting in temperature conditions for the air, soil and canopy that were 1.42/1.77°C (day/night), 1.68/2.04°C (day/night) and 2.08°C (day) higher than the control temperature treatment, respectively. Sixty days after sowing, the scientists conducted several physiological and biochemical measurements on fully expanded ear leaves at the heading stage of the maize plants. In discussing their findings, Zheng et al. report that experimental warming "significantly enhanced the maximum values of net photosynthetic rate (An) by about 60% (P = 0.004) from an average of 18.6 µmol/(m2 s) for plants grown at ambient temperature to 29.8 µmol/(m2 s) for plants grown at elevated temperature." What is more, as indicated in Figure 1 (left panel) below, the authors note that the optimal temperature for plant photosynthesis (Topt) in the elevated temperature treatment also rose by 2°C compared to that observed in the ambient temperature treatment (i.e., Topt rose from 29.0 to 31.0°C). 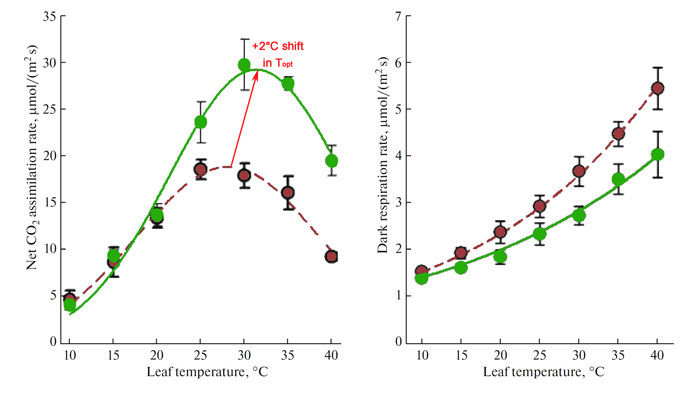 This observation, in conjunction with their finding that leaf dark respiration rates were consistently greater in the ambient, as opposed to the elevated temperature treatment (see Figure 1, right panel), helped improve leaf carbohydrate levels, where warming "significantly enhanced the concentration of soluble sugars by 43.7% (P < 0.01)," starch concentrations by 20% (P < 0.05) and total nonstructural carbohydrates by 30.8% (P < 0.01). Consequently, in light of these and other findings reported in their study, Zheng et al. conclude that in response to warming, maize plants experienced an apparent "thermal acclimation of the net photosynthetic rate and leaf dark respiration," which "may mitigate or even offset the negative impacts on maize from future climate warming." Indeed, such findings suggest a warming climate may well produce higher crop yields, which is a far different tune than what climate alarmists have been playing for so long now. And this new tune is welcomed music to our ears! Figure 1. Net CO2 assimilation rate (left panel) and dark respiration rate (right panel) of maize plants under control (red dashed line and circles) or elevated (green line and circles) temperature conditions. The left panel indicates that the optimum temperature for photosynthesis (Topt) under control temperature conditions is approximately 29°C, but rises to approximately 31°C in the elevated temperature treatment. Source: Zheng et al. (2018).